Q: How can I get reviewed? Q: Why did you start Geoff Wilbur’s Music Blog? Q: What style of music do you cover? Q: Who reads Geoff Wilbur’s Music Blog? Q: How can I make sure I don’t miss any reviews or articles? Q: Can I write reviews for Geoff Wilbur’s Music Blog? Q: What should I do if I find a broken link on this site? ArtPrize 2018 is upon us. 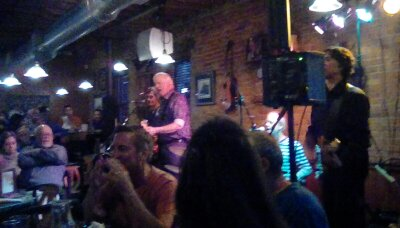 After getting my credentials I went to one of the mainstay eateries in downtown Grand Rapids for some live music. That Beatles Thing, as you can surmise, plays the music of the Beatles with some of the authentic instruments. As a nod to ArtPrize 10, they decided to perform the songs of the album Rubber Soul. Pete Bardolph introduced the evening and let the audience know that there were two versions of the album, an American version and a British version. They started the night with “Drive My Car.” They quickly followed that up with “I’ve Just Seen A Face.” And they basically played the album as they advertised they would. The band is: James Murphy, vocals and playing guitar (and driving force of the band); Bill Van Ess, vocals and bass; Pete Bardolph, one of the longtime owners of Rainbow Music, singing and playing lead guitar; and Fritz von Valtier, who rounds out the foursome with drums and vocals. If you are a Beatles Fan, you’ll appreciate their live performance. Their upcoming shows include Saturday, October 6th at the Grand Haven Eagles #925 in Grand Haven, MI; Saturday, October 13th at the American Legion Boat and Canoe Club in Grand Rapids, MI; and Friday, October 19th at Woody’s Press Box in Wyoming, MI. For additional shows beyond those, check the band’s website or its Facebook page.